Elaine Hancock (Olney, United States) on 12 September 2014 in Plant & Nature. I pass by this tree often. I like seeing it change with the seasons. It is on a farm that was sold and is supposed to be turned into a multi-use site with parkland but there is a lawsuit that has been going on for years. The original landowners claim that the buyers are not abiding by the original contract agreement and want to use the land for an industrial site. 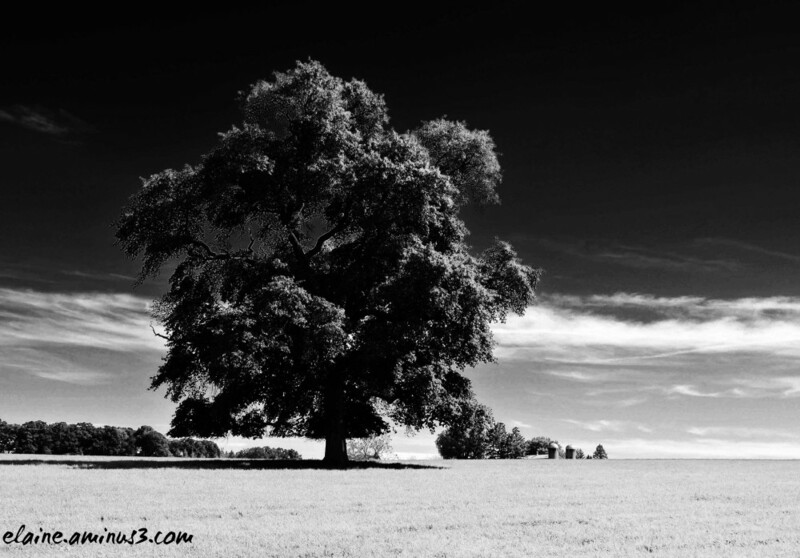 Strange how 'lone' trees make such a strong statement - this is a fine example strongly presented. Beauttiful B&W shot !!! Great catch ! Powerful image - let's hope nature stands strong and the tree continues to change with many more seasons. This is an excellent black and white image. The tree looks great. Too bad about the lawsuit. Quel bel arbre ample et grand quel rendu et vue superbe. such beautiful composition, clouds, lighting, shadows & treatment! Que de majesté ici !!! superbe !!! Wonderful celebration of this nobility .. beautiful image ..
@Steyners: Thank you so much! I really appreciate it! . . and Congrats on the Spotlight, too ! @Ronnie 2¢: Thanks so much Ronnie! Une très belle photo, félicitations. Quelle belle photo ! Magnifique. @Etsu: Thank you so much Etsu! I appreciate it! Congratulations on a well deserved SPOTLIGHT!!!!!!!!! @Ruthiebear: Thank you so much Ruthie! I really appreciate it! @Akbar&Armaghan: Thank you very much! Superbe ! Félicitations pour le spotlight! excellent idea to put this striking image in the spotlight! congrats !!! @franz: Thanks a lot Franz. I hope so too. This lawsuit has been in the courts going back and forth since 1989. Wonderful image... Congratulations on Spotlight. @PRASHANT: Thank you so much Prashant! @LauraS: Thank you so much Laura! I really appreciate it! Excellent monochrome ... the contrasts and light are fabulous !!! @Baldwin Vandewalle: Thank you so much Baldwin! I really appreciate it! @Linda Candilas: Thank you so much Linda! Majestic! A very nice B & W, Elaine! Oh, Elaine ... this is absolutely awesome and well worth your adventure. AWESOME! Congratulations on the spotlight too!